Recognizing the unique value of M-119 and the area surrounding the roadway, the M-119 Heritage Route Management Plan will strive to protect, preserve, and enhance the natural, scenic, and cultural character of the M-119 Heritage Route. 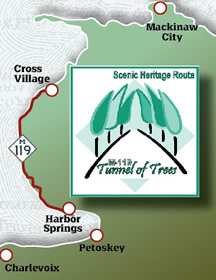 The M-119 Tunnel of Trees Scenic Heritage Route Committee is dedicated to preserving and enhancing the scenic, cultural, natural, and historic characteristics of the M-119 corridor through Friendship, Readmond, West Traverse, and Cross Village Townships. The Committee is made up of representatives from four townships and the Emmet County Lakeshore Association. The Little Traverse Bay Bands of Odawa Indians, the Emmet County Planning, Zoning, and Construction Resources, and the Michigan Department of Transportation are active partners in the Committee’s activities. The second Tuesday in the months of January, April, May, June, July, August, September and October at 9:30 am at various locations. Please note the meeting announcements on the main webpage.